Well guess what? If you looked closely, you DID see a swoosh on Leo Manzano’s uniform. 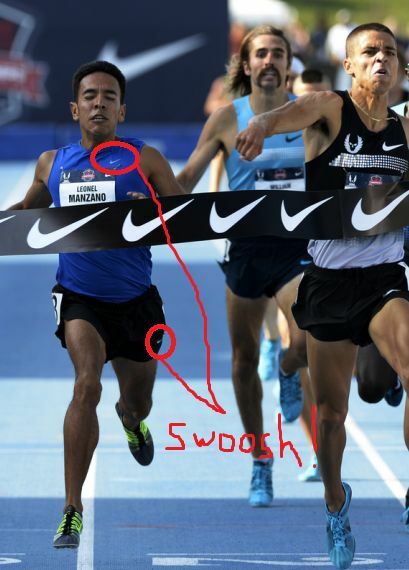 In the story’s last paragraph, the author Tim Layden notes that in his qualifying heat, Manzano wore “a generic blue shirt and black shorts, like a guy in the Monday night all-comers meet.” Perhaps the swoosh is so ubiquitous that Layden’s eyes glazed right over the swooshes adorning Leo. By my count, there are 15 visible or partly visible swooshes just in the cropped photo above. The photo is from the finals. Leo wore the same shirt in the semis, and the same shirt at the Diamond League meets earlier this year in New York and Eugene. Leo had a bigger swoosh on the blue USA top he wore after the finals on Saturday while being interviewed. In short, despite running without a Nike contract, Leo has been wearing the swoosh this whole time. So what? Anybody can buy a Nike singlet to wear in competition. He’s obviously not sponsored with nike at the moment. Don’t see what the big deal is. And he actually wore a generic black tabletop in his A standard grabbing 1500 recently. Yeah, at the July 6 Paris race Leo wore a generic black top (which he dubbed in an interview the “Leo Manzano special elite Austin Track Club singlet”) and black Nike tight shorts. Leo is fun to watch regardless of what uniform he’s wearing. In the context of reporting about Leo’s lack of Nike sponsorship, that he keeps wearing Nike is an important detail. Leo certainly isn’t burning bridges with Nike, as the company continues to benefit from Leo representing its brand.